Zootopia is a 2016 computer-animated fantasy film from Walt Disney Animation Studios (WDAS). Directed by Byron Howard and Richard Moore, the film was originally released to theaters in 3D. It is the 55th animated feature film in the “Walt Disney Animated Classics” line, with John Lasseter of Pixar being the film's executive producer. Zootopia follows a rookie bunny cop who unites with a cynical con artist fox to uncover a dark conspiracy. 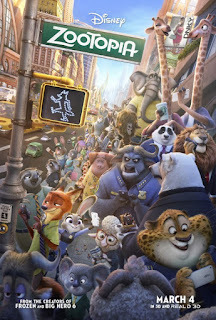 Zootopia is populated by anthropomorphic mammals (cartoon or fictional animals that walk and talk like humans). Officer Judy Hopps (Ginnifer Goodwin) is a young female rabbit from the rural hamlet of Bunnyburrow. Her childhood dream was to be a police officer. She recently moved to the urban utopia of Zootopia where she just became a rookie cop with the Zootopia Police Department. However, her boss, Chief Bobo (Idris Elba), a cape buffalo, does not believe that a bunny can be a cop; honestly, almost no one believes a little bunny rabbit can make it as a cop. Chief Bobo assigns Officer Hopps to the traffic division where she becomes a meter maid, handing out parking tickets. Early in her career, Judy is even tricked by Nicholas P. “Nick” Wilde (Jason Bateman), a cynical red fox who runs various cons and hustles. Fate brings them together to solve the mystery of missing mammals, and the straight-laced Judy and street-smart Nick make a good team. However, neither understands the true extant of the conspiracy surrounding this missing persons case. After Disney formally purchased Pixar (in 2006), the deal essentially united the Oscar-winning computer-animation studio with Walt Disney Animation Studios (WDAS), there has been a marked improvement in the computer-animated films produced by the WDAS. The credit for that success often goes to Pixar's John Lasseter who is Chief Creative Officer (CCO) for both units. Under his watch, Walt Disney Feature Animation has produced such smash hits as Tangled and Wreck-It-Ralph, as well as the Oscar-winning, worldwide, monster hit, Frozen. I keep thinking that there is nothing left that either Pixar or WDAS can do to surprise me, but Pixar blew my mind with last year's Inside Out. Now, I am stunned by Zootopia, which is not only fantastic, but is also timely. Zootopia is an American animated film that is aimed at the broad family audience, yet bluntly addresses issues of prejudice, discrimination, and stereotypes. Zootopia is a film about us, the human race, but especially about the United States of America. As the lead characters, Judy and Nick, Ginnifer Goodwin and Jason Bateman give performances that certainly deserve to be called great. Goodwin gives Judy so much color and depth, making the bunny cop a character that is bigger than than this movie; Zootopia seems to be a single chapter in the life of a fictional character with much more to say. Bateman delivers his usual genial, smooth, and droll comedy style onto Nick, but he makes the sly red fox the wise, guiding hand that a young rookie bunny cop needs. Thoughtful and occasionally brilliant, Zootopia cheats a little in its last act, taking the easy way out so that it can deliver a happy ending. Still, even its action-centered resolution of the conspiracy offers a delightful surprise and sticks to the story's message about the harm of prejudice and the dangers of racism and xenophobia. Perhaps, live-action films can learn a lesson from the state-of-the-art, computer-animated Zootopia. Movies can be smart, timely, and deliver a few messages AND also be big, entertaining event films. The text is copyright © 2016 Leroy Douresseaux. All Rights Reserved. Contact this blog for reprint and syndication rights and fees.